We’re pleased to announce the next in our series of Book Creator ebooks, focusing on secondary education. Book Creator is often thought of as an app aimed at elementary aged pupils. Yes, Book Creator is a simple-to-use tool, which means it’s proven popular with younger students as they are able to learn how to use the app with ease. But the success of Book Creator as an elementary app has a lot to do with the success of the iPad as a learning device, which Apple have focused mainly at K-5. We’ve always maintained that Book Creator is a universal app which can be used in any grade, for any subject. We’re seeing more and more evidence of this with Book Creator for Chrome being used from grade 4-5 onwards in a lot of schools in the US. As students migrate from using iPads to Chromebooks and other PCs, they are taking Book Creator with them as a tool they are already familiar with. And why not progress this trend into High School? The tasks and problems students are trying to solve might be more complex, but the rules of digital storytelling still apply, and having a tool such as Book Creator at your fingertips, where you can use multimedia to demonstrate your learning and creativity, is as important as ever. With this in mind, we approached Michael Hernandez, an award-winning high school cinema and journalism teacher in Los Angeles, whose work focuses on digital storytelling, media literacy and social justice. Drawing from his experience as a high school teacher who uses Book Creator in his classroom, Michael has written this excellent introduction to Book Creator for fellow secondary school educators: ‘Book Creator for the High School Classroom‘. This free ebook serves as inspiration for how to use Book Creator in a high school setting, no matter what subject you teach. Examples and practical tips help keep the focus on curriculum and how to transform your classroom lessons. The book is part of an expanding library of ebooks we’re building to resource teachers. 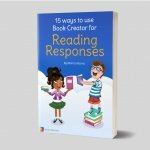 We’ve already released 50 ways to use Book Creator in the classroom, and 15 ways to use Book Creator for Reading Responses. And we have more lined up in this series. Like all the books in this series, Book Creator for the High School Classroom was written and published online using Book Creator. So you can read it online now, watch the author’s video introduction and listen to Michael’s own reflections on each subject of the book. Just open the book below. If you wish to read the book offline, you can also download it from Apple’s iBooks Store.